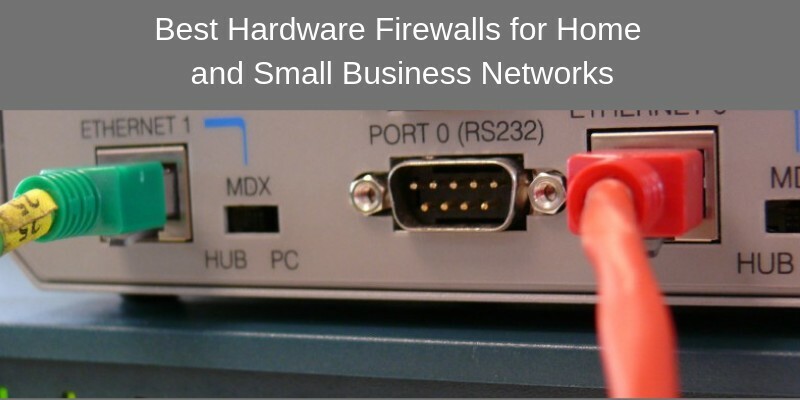 On this website I have written tens of articles about enterprise level firewalls (especially Cisco ASA) but many people are interested to learn about the best hardware firewalls for home or small business networks, so this is what I’ll focus in this article. Firewalls are designed to monitor incoming and outgoing traffic, helping to keep your local network secure. While most computers have software firewalls installed, other devices lack their own security. In a typical home network, video doorbells, baby monitors, and smart home devices are only as secure as the basic firewall inside the Wi-Fi router connected to the ISP. With a hardware firewall, you get an extra level of protection for securing all devices in the home or SOHO network. A dedicated hardware firewall usually connects to your router and your devices connect to the firewall, thus reducing the risk of hacking and malicious cyber attacks. Some hardware firewalls even allow you to monitor your child’s Internet usage and receive text alerts of potential cyber threats. To increase the security of your network, consider adding one of the following 10 hardware firewalls which are suitable for home and small business networks. I have carefully selected the following devices based on their feature set, how effective they are, trustworthiness of manufacturer etc. I have grouped this article in two general categories. Let’s start first with the best models for home use. Firewalla is one of the easiest hardware firewalls to install and set up, making it a great option for the average homeowner or non-technical business owner. PARENTAL CONTROL AND FAMILY PROTECT - The days of pulling the power cord from the dusty old router are behind you; with just a few taps on the smartphone, you can see what they're doing, cut off all access, or cut off only gaming or social networks. Turn on Family Protect to filter and block adult and malicious content, keep internet activities healthy and safe. The company produces an affordable version that supports up to 100 Mbit/sec bandwidth (the Red model) and a more powerful version that supports 500 Mbit/sec speeds (the Blue model). Red Model: If your Internet speed is less than 100Mbps and have less than 50 home devices. Blue Model: If your Internet speed is more than 100Mbps and have more than 50 devices (e.g business network). Both versions allow you to monitor devices and networks via a mobile app with a simple user interface. Easily adjust any of the settings, including auto-blocking and parental controls. The device simply connects to a power source and your existing home router. You can connect Firewalla in any current network setup that you have such as combo router/modem from ISP, separate modem and router, mesh WiFi network etc. After installing the app, you can instantly begin monitoring Internet traffic that goes in and out of your local network to anywhere in the world. Firewalla also includes a built-in VPN server, allowing you to establish secure connections with your home or business network while away from the home or office. Intrusion Prevention and CyberSecurity protection for all of your devices. Not suitable for Gigabit internet speed. With the Ubiquiti Unifi Security Gateway, you get a hardware firewall and router that supports Gigabit Ethernet speeds. While the device is intended for use in businesses, it is affordable enough for home use as well. The device sits between the Internet and the local WiFi router, routing all traffic before it even reaches the router. All devices connected to the network are then monitored and protected through the advanced network management features. As with other hardware firewalls, remote monitoring is available through a web-based app or mobile app. Users can also change firewall settings, create guest portals, and establish hotspots. The management features are part of the Unifi Controller Software, which also includes monitoring solutions for surveillance systems. The Bitdefender Box 2 is designed to provide a simple method for protecting your home network and Internet of Things (IOT) devices. After connecting to the router, the device automatically begins monitoring and optimizing your network for the best security. With the 1.2 GHz dual-core processor, the device can support speeds up to one Gbps. It also supports the latest smart home controllers, including Google Assistant and Amazon Alexa. This is also a WiFi router with Dual-Band (2.4GHz and 5GHz) AC1900 speed wireless radio, thus protecting both wired and wireless devices in the home. The hardware firewall includes typical monitoring and security features along with software and cloud-based protection. Additional security features are provided through the Bitdefender Total Security antivirus service. You get a free one-year membership with yearly subscriptions available after the first year (for protection of unlimited home devices). The Box must be connected to your existing router which must be configured either as Access Point (AP Mode) or Bridge Mode. In order to apply the enhanced and advanced parental control features of Bitdefender, your computers and mobile devices must have “Bitdefender Total Security” installed on them. This is good because you will get great Antivirus protection as well. BitDefender is a very effective Antivirus and Anti-Malware vendor with proven history record. Advanced Parental and Monitoring features applied right on the End-point devices (smartphones etc). The CUJO AI Smart Internet Security Firewall is built for home or business use and features anti-virus, malware, and phishing protection for all connected devices. It connects directly to the WiFi router and supports up to one Gbps Internet. Standby: CUJO does not protect the network. Used for troubleshooting and configuration assistance. Direct/DHCP: In this mode, you should disable DHCP on your home router and allow CUJO to provide IP addresses to the network. This is the most preferable way to operate. Bridge Mode: For networks that have multiple WiFi routers and Access Points. Connect all of them to CUJO for full protection. Using the CUJO AI mobile app, users can quickly set up the physical box. It works with most WiFi routers, including WiFi extenders and mesh routers, except for the Google WiFi mesh. After setting up the hardware firewall, CUJO provides 24/7 protection for computers, smartphones, tablets, and smart devices. With remote monitoring, users can instantly see what devices are connected to the network and what websites are getting visited. CUJO is simple enough for home use but still includes the sophisticated protection needed for business security. Can identify if a local computer is compromised with Botnet malware etc. Flexible connectivity options to the rest of the network. Minimal amount of controls (no firewall options for customization etc). Zyxel Next Generation VPN Firewall offers Internet security both locally and remotely. After installation, users can access their local networks remotely through secure VPN connections. This device was designed as an enterprise-level solution for enhanced security and remote VPNs. However, the simplified installation process and affordable price make it suitable for home use as well. The existing Internet connection and router or modem connect directly to the Zyxel Firewall, which also includes four Ethernet ports. Zyxel Firewall includes support for IPv6 and multi-WAN failover. This device is categorized as UTM firewall which means Unified Threat Management. This refers to protection at the application level such as web content inspection, application controls, antivirus, intrusion prevention etc. You will need a yearly subscription license to use these application layer features though. Without subscription, the device is still a solid hardware firewall device. Allows users to setup up to 10 secure VPN connections using Layer-2 Tunneling Protocol (L2TP) and IPSEC. Device is very reliable and solid. The Firewall WAN only supports about 200 Mbps to 350 Mbps transfer rates. The devices in this category are slightly more expensive than the previous ones but they are best suited for business environments with more demanding requirements. The TZ series of SonicWall firewalls are entry-level business models suitable for small to medium offices or branch offices belonging to a larger corporation. SonicWall is well known for manufacturing excellent firewall products and the TZ series are no-exception. The SonicWall TZ400 offers enterprise-grade network security through its Unified Threat Management (UTM) system. It provides hardware, cloud-based, and software antivirus and network monitoring for a complete security solution. To take advantage of all UTM software security features, a license subscription is needed just like all other UTM firewall appliances. As an enterprise-level product, the TZ400 can support over 100 additional ports when combined with the Dell X-Series network switches. Thanks to the processing power of this device, the TZ400 can perform deep packet inspection of all Internet traffic without reducing transfer speeds. The device offers 1.3 Gbps throughput with real speeds of 900 Mbps for WAN connections. SonicWall is a trusted vendor with proven record in UTM firewall appliances. High performance optimized device for not compromising in speed even if advanced security features are enabled. FortiGate has experienced the most impressive growth as a security manufacturer the last years. This company launched some of the most flexible firewall devices (both UTM and Enterprise-Grade models) in the market. The FortiGate 30E is designed for small to mid-sized businesses and provides complete protection and Unified Threat Management (UTM) services to users. The device is simple to set up and uses cloud management for easier administration. The device also includes four LAN Gigabit Ethernet ports for connecting computers, routers, extenders, or switches. In such a small device you can find advanced security protections such as application control, advanced threat protection, Intrusion Prevention System (IPS), Web Filtering, VPN etc. Fortigate devices support the VDOM feature which lets you create several virtual firewalls on the same hardware device thus segmenting the network to different zones such as guests, employees, public servers etc. Fortigate firewalls are among the most flexible and feature-rich devices in the market. FortiNet as a company is one of the most trusted manufacturers of security devices. The hardware firewall supports 950 Mbps of pure firewall throughput and 150Mbps throughput if all Threat Protections are enable (which is pretty good for a small business). Requires a subscription to continue using the security and support services (just like all other UTM vendors). Cisco is the leading manufacturer of enterprise-level networking solutions. Meraki has been acquired by Cisco to serve the SMB market of wireless LAN products (and also other SMB network solutions). With the Meraki MX64W, the company has created a WiFi router and hardware firewall with superior Internet security features. Users can also maintain fast Internet connections. The device uses layer 7 application visibility to monitor and prioritize traffic without significantly reducing bandwidth, supporting up to 1.2 Gbps WiFi speeds and 250 Mbps firewall throughput. Cisco also provides advanced security services for an additional fee. These options include advanced content filtering, Cisco Threat Grid, and advanced malware protection. Support for up to four WiFi access point SSIDs thus segmenting the network. Ability to support up to 50 users (great for small-medium offices). Meraki and Cisco are well established brands in the field of networking and firewall security. You get a future proof product with unprecedented vendor support. A relatively expensive option that may be out of reach for some businesses. The Protectli Firewall Appliance features an Intel Quad Core Celeron processor with 4GB RAM and 32GB SSD drive making sure that almost any open-source firewall software will be running great on it. It also includes 4 gigabit Ethernet ports, including a LAN and WAN port for connecting the device to a home network. The device is intended for experienced users and electronics hobbyists. It uses open-source software firewall distributions, which require some technical knowledge to install and configure. The company also calls the device The Vault. The small form factor PC is built for use as a hardware firewall/router and includes a 32GB mSATA solid-state drive and 4GB of DDR3L RAM. However, users may upgrade the RAM up to 8GB. Some open-source firewall and other software that can be installed on this module include pfsense, dd-wrt, FreeBSD, ClearOS, CentOS, OpenVPN etc. Works with a wide variety of open source firewall projects. Provides a customizable solution for advanced users who can install a great open-source firewall for great protection. Offers whisper-quiet operation with fan-less construction with no mechanical or moving parts. WatchGuard Firebox T15 is a WiFi router (select models only) and hardware firewall in one device. This small box connects directly to the Internet and can be used as an access point for the local network. It supports 802.11b/g/n WIFI and 2.4 GHz and 5 GHz bands (in the wifi version). The T15 is intended for up to five users, offering 400 Mbps speeds through the hardware firewall and 90 Mbps speeds when the software UTM features are enabled. By UTM features we mean the software protection mechanisms such as intrusion detection, antivirus, ransomware protection, data-loss prevention etc. If you have more office users then select the T35 for 20 users or T55 for 30 users. Users can also configure their own secure VPN connections with speeds up to 150 Mbps. With the provided Ethernet ports, users can directly connect three computers or routers for one Gbps transfer rates. Performance is reduced considerably (90Mbps) if all UTM features are enabled.